You can really go wild with this one, using what is carried at your local hobby store or ordering some of the more exotic scents off of the internet. My favorites are Coconut, Lemongrass, and Lavender. In a large mixing bowl, mix 2 cups dried milk with 1 cup dried coconut milk. Add 1/2 baking soda and 1/2 cup cornstarch. Once mixed well, it's time to add scents. Do this lightly, as you want to avoid clumping. I added just a few drops at a time and stirred really well in between adding drops. 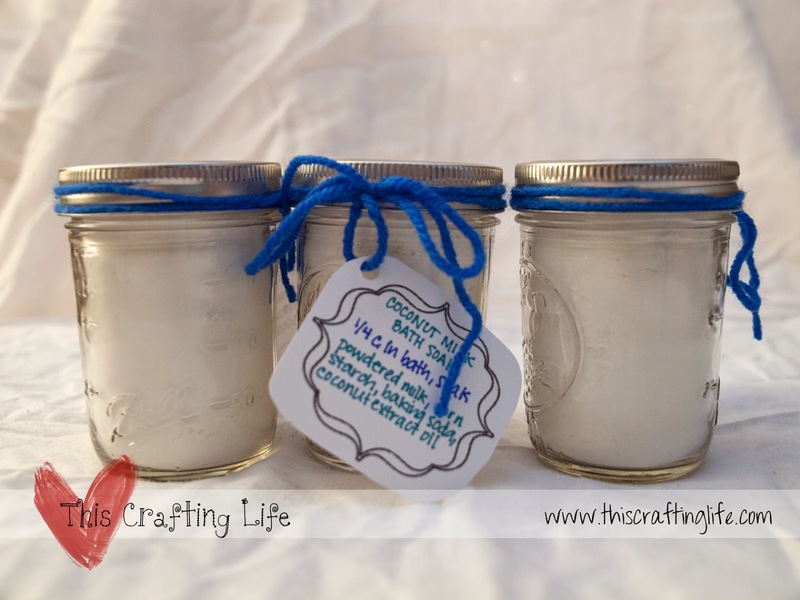 Once you have enough scent, scoop into your jars and add cute gift tags with usage instructions.